Last Tuesday night, ANC6B’s Planning and Zoning Committee endorsed a request for support from Barracks Row Main Street (BRMS) for its application for a Public Art Building Communities Grant to create public art for Eastern Market Metro Plaza. Martin Smith, Executive Director for BRMS (sort of a local Chamber of Commerce for Barracks Row) presented the concept to the committee in a bid for ANC and community support for the project. He told the committee the current ideas on the drawing board (pictured above) would provide interim beautification of the Plaza pending its redevelopment (See here: http://bit.ly/1duqZJd) and would become part of the design following completion of that redevelopment. 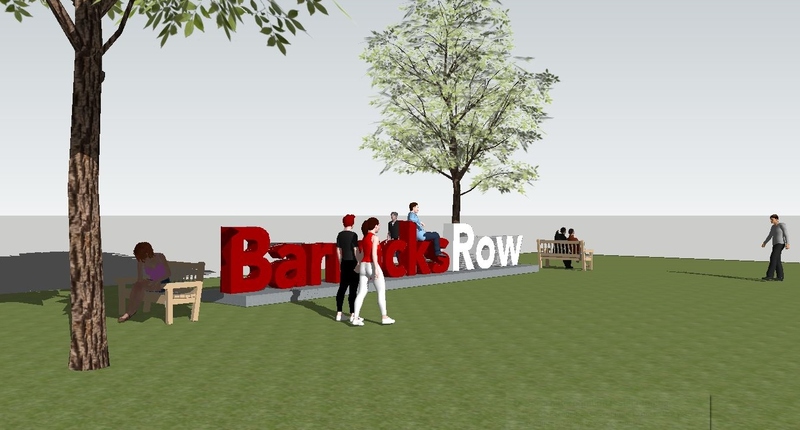 As envisioned, the 36 inch-high letters comprising the pieces would be fabricated from polycarbonate, and would serve a marketing and branding purpose for both Barracks Row and Eastern Market. Smith said the pieces would be interactive for both children and adults. The grant requires matching funds, and BRMS would have to raise half the projected $200,000 cost of the project. While the Committee seemed to be fully behind the idea of public art for the Plaza, the proposal that Smith presented was greeted with some skepticism. Committee Resident Member Ivan Frishberg said he was “not thrilled with the design” and questioned whether the concept was primarily art or primarily marketing. He said he was a “little skeptical” about the piecemeal adding of art to the overall concept for redevelopment of the Plaza and expressed concern that an ANC endorsement of the project might end up being represented before city agencies as an endorsement of the design. Commissioner Oldenburg said she fully supported the idea of sculpture for the Plaza on an interim basis, but that she, too, was “not crazy about the design.” She said she would support BRMS going after the grant for some kind of sculpture for the Plaza. In response, Smith told the Committee that it would be a long process, that several agencies would have to pass on the project before final approval, and that the concept drawings presented Tuesday night might well bear no relationship to the final design. The Committee voted to recommend that the full ANC support the grant application provided that if granted, the applicant returns to the ANC for further consultation. The vote was 8 – 0 – 1 (Frishberg abstaining). For starters, why don’t we replace the dead tree that’s been standing at the center of the Metro Plaza for over a year now? And maybe this time, don’t kill its replacement by overwatering it as soon as it’s put in the ground. What a sorry 1st impression of the Hill for visitors arriving by Metro. One must hope that eventually an adult will intervene and put a stop to this travesty. Our city has plenty of real sculptures and genuine art – the last thing eastern market plaza needs is this “temporary sculpture” that looks like it was heisted from a playground by a bunch of pranksters. The ANC should stop supporting the waste of our public resources on junk! Take care of the trees! Someone please remind me why Barracks Row Main Street even exists. Before they improved the streetscape, it was an urban blight. They can stop now. I don’t like this AT ALL! 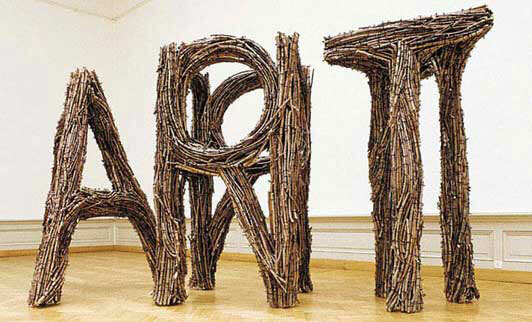 It’s not art, it’s a sign and not a very good one at that. Hideous, really. I don’t see how this could possibly be seen as an improvement and good luck with the Restoration Society! I saw this design and the new Google logo on the same day. I feel the same way about all of it and that’s not good. If they change the letters to read “WASTE,” I’d support that. The.benches and manicured grass seem quite inviting. I’ll have to go look for these amenities tomorrow. By any chance are they near the rat-proof tree boxes?